Turkey ▸ Fethiye ▸ Fethiye Eating & Drinking ▸ A Day Trip To Kayaköy – Kendin Pişir, Kendin Ye! A Day Trip To Kayaköy – Kendin Pişir, Kendin Ye! We live in a beautiful area of Turkey and are very lucky that when we want to go out for the day, we don’t have to travel far from Fethiye to reach any number of amazing places. Kayaköy (labelled as the ‘ghost village’ in tourist brochures) is one such place. We trek to Kayaköy quite often in the cooler months but on Thursday, we went with friends by car. It was the perfect end to our friends’ holiday. Green countryside, a cool breeze – and a barbecue! That’s what a visit to Kayaköy is all about for us. There are numerous restaurants in the village that are Kendin Pişir, Kendin Ye. This translates as ‘Cook It Yourself, Eat It Yourself.’ And that’s exactly what you do. First of all, a visit to the fridges is required. Traditional Turkish restaurants don’t have menus. It’s very much a common sense practice of going to see what’s on offer and choosing what you fancy. Survey the fine foods before you and choose your mezeler. We chose roasted red peppers, two different aubergine salads, and fried peppers and potatoes topped with garlic yoghurt, chilli oil and whole dried, charred red chillies. It’s easy to get carried away at the fridges because all the food just looks too tempting but you have to remember to leave room for your barbecue. After ordering the starters from the waiter, tell him which meat you want and how much – we always go for pirzola (lamb chops) – and as you’re sampling your tasty meze plates, your meat, onions, peppers and tomatoes will arrive, raw. Then the barbecue will arrive, already prepared, and you can cook your food when you’re ready. Fantastic! We usually go to Cin Bal Restaurant in Kayaköy which is our favourite, probably just because we went there the first time we ever came to Fethiye for our holidays in 1998 so it holds happy memories. On Thursday, we went to Yalçın Kebab, shown in the top photo. It was our first visit and the meze plates were gorgeous. The waiter cooked our food for us on the barbecue so we cheated a bit. Vegetarians are catered for too. Our friend is vegetarian and the waiter prepared some huge field mushrooms and stuffed them with cheese and a bit of garlic butter. I was almost coveting them. If you come back from Kayaköy by dolmuş, it takes you through Hisarönü but if you go by car, it’s much more pleasurable to take the old forest road which winds steeply down, back towards Fethiye. Once you reach the top of the hill, it provides stunning views over the whole bay and marina. 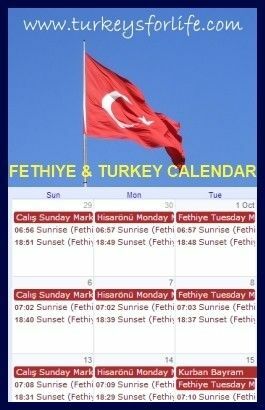 As you can see from the photo, we’ve had some very odd Fethiye weather for the time of year. Cloudy and hazy but very warm and humid. Fortunately, the last two days have been back to normal and we are basking in glorious sunshine once more. Life’s good. Yalçın Kebab is also famous for it’s fabulous Turkish breakfast. Yalçın Kebab is on Kaya Caddesi. If you are arriving from the Hisarönü road, it’s signposted to the right just after the main entrance to the ruins. Yalçın is open all year and has a heated indoor seating area when the weather’s too cold to sit outside. You can view Yalçın and other places to eat and drink in Kayaköy on our map of Fethiye. Look out for the pink knife and fork symbols. The concept is great, but I appreciate that your waiter was there to do the grilling for you. The image of the set tables is lovely, for some reason it makes me think of Chekhov. Your description of a perfect day in your area reminds me of the communal meals in the Italian country side with set tables set up for anyone who’s willing to buy a meal ticket. I love your blog, it’s great to read about your finds. Thanks Judith. We don’t cheat usually. We do our own cooking but it was lovely for a change to have someone else do it because it was our friend’s last day. A treat. was geting worried, you have disappeared for so long but I see you are doing quite well. Lovely outdoor lunch in the shade of the trees. Here it is already too hot. Doing our fighting best to keep with the internet stuff and summer visitors Sarah. No easy task. Do you get influxes? We’re visiting loads of great places but not time to blog about them or tweet/facebook them. Catch-up over winter! You know we visited Kayaköy last month – what an amazing place. Good to see there are some non-nostalgic places there too! Where are these little eating places? Can’t say we saw them … I am going to keep this post for next time!